In a prior post, I showed how to create some native Java scatter plots and a quantile plot in Tablesaw. Since then, I’ve added a few more plot types. Histograms are a must have. We use the plotting capabilities of the Smile machine learning library to create the one below. This is currently the only Smile plot we’re using, but there’s more to come. Heatmaps, Contour plots and QQ plots are coming soon. We’re also starting to integrate Smile’s machine learning capabilities, which will be a huge step forward for Tablesaw. Bar plots are unglamorous, but very useful. Tablesaw can produce both horizontal and vertical bar plots, and also creates Pareto charts directly as a convenience. They’re all based on the JavaFx chart library, and like the other Tablesaw plots, they’re rendered in Swing windows. Here we show a Pareto chart of tornado fatalities by US state. The code to produce this chart, including a filter to remove states with fewer than three fatalities is shown below. The grouping is done using the summarize method, which produces tabular summaries that can be passed directly to the plotting API. Note the use of the #sum method. Any numerical summary supported by Tablesaw (standard deviation, median, sumOfLogs, etc.) can be substituted for easy plotting. As you can see, loading from a CSV, filtering the data, grouping, summing, sorting, and plotting is all done in three lines of code. Finally, we have a BoxPlot. I hope you’ll find Tablesaw useful for your data analytics work. These plots provide visual feedback to the analyst while she’s working. They’re for discovery, rather than for presentation, and ease of use is stressed over beauty. Behind the scenes, the charts are created with Tim Molter’s awesome XChart library: https://github.com/timmolter/XChart. The following chart is taken from a baseball data set. It shows how to split a table on the values of one or more columns, producing a series for each group. In this case, we color the mark differently if the team made the playoffs. A chart that looks like a scatter plot and works like a histogram is a Quantile Plot. The plot below presents the distribution of public opinion poll ratings for one US president. As of today, you can easily import into Tablesaw from any data source with a JDBC driver. Meaning, pretty much every relational database. Meaning, we are now fully compliant with the 1970s, and with Ted Codd, who I’ve stolen many ideas from. Now I’m repaying Ted by putting his photo in this post. To use this feature, you write standard Java/JDBC client code, execute a query, and pass the returned ResultSet into a static create() method on Table. There’s a simple example below. So bring on your databases. My work on Tablesaw is focused on making as many data-munging jobs doable on a single machine as possible. It’s a tall order, but I’ll be getting a lot of help from hardware trends. KDNuggets recently posted poll results that show that most analytics don’t require “Big Data” tools. The poll asked data scientists about the largest data sets they work with, and found that the largest were often not so large. A majority of data scientists (56%) work in Gigabyte dataset range. In other words, most people can do their work on a laptop. The more interesting finding was that RAM is growing faster than data. By their estimate, RAM is growing at 50% per year, while the trend for the largest data sets is increasing at 20% per year. Should we be scaling by using single machines with very large memories rather than clusters? We conjecture that, in terms of hardware and programmer time, this may be a better option for the majority of data processing jobs. Since this is my day job, I’m of course paranoid that the need for distributed learning is diminishing as individual computing nodes… become increasingly powerful. Jure Leskovic’s take on the best way to mine large datasets. Jure said every grad student is his lab has one of these machines, and that almost every data set of interest fits in RAM. Pretty soon, you can have one, too. 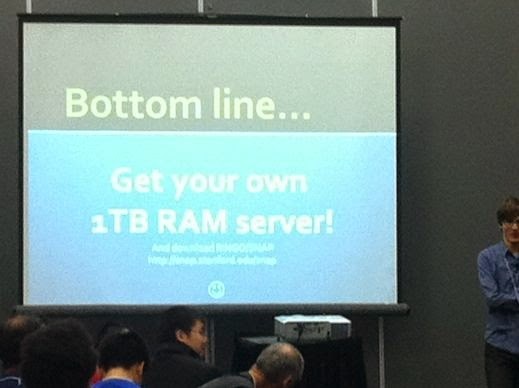 Amazon has dropped hints that EC2 instances with 2 TB of RAM are coming soon. Once you have one, you can make the most of it by using a RAM optimized data manipulation tool. This is, of course, the idea behind Tablesaw.